I believe it's true: Poets are the world's most experienced decision-makers. Because words matter so very much, every day poets first make the all-important decision: To pick up the pen, to write. Then, we make dozens of decisions as we write each poem. We decide on the topics of our poems: tyranny, violence, greed.... We decide on verbs: protest, occupy, change. We decide on line breaks and stanza breaks, thus: “So much depends/ on weather/ and the thin / quality/ of mercy.” We decide which images to use: “as winter bites/ the fraying jacket rips” will depict homelessness. We decide on appropriate figures of speech: “the money lenders sip bubbly/ and nap like Persian cats.” We make a hundred more decisions as we revise: Delete “begging;” replace with “pleading.” We decide to title our poems: “Unemployed,” “Bread Not Bombs,” “The EU Commissions a Group Portrait by Van Gogh.” And every day poets who are editors decide to publish our decision-laden poems. 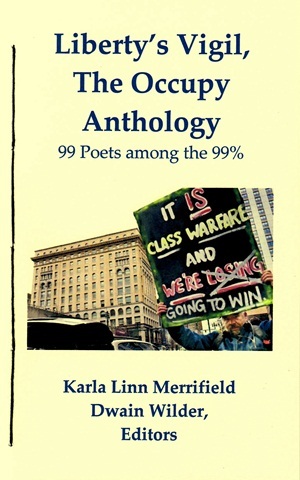 On the night I first listened to “The Tides Are Turning,” Roger Waters's stirring anthem of the Occupy Movement, I felt “warmed to the sight of a billion candles burning.” His poetic words warmed my entire being, and I made the decision: This anthology had to be. And the very next day poet Dwain Wilder decided to join me in the endeavor as co-editor. And three days later poet Michael Czarnecki decided FootHills Publishing would produce the collection. And soon poets around the world decided to send forth their poems to be considered for Liberty's Vigil-because they had decided it's time to change the world. As 99 of our world's most-important decision-makers (from 22 states and six countries), all poets assembled herein, occupying this book by virtue of our poems, invite you to make your most-important decision: to join us and occupy the Earth with hope for a better world. Thank you, fellow poets; thank you, readers. The challenge for public poetry in such a moment as we find ourselves, literally occupying the places of corrupt power and calling it by its true name, is well stated by Paul the Apostle to be “in the world but not of the world.” If as poets we aspire to “speak truth to power,” to use the well-regarded and felicitous phrase, we must somehow see public action and speech as tropes, figures of the many expressions of the human condition. Thus poetry, while not quite rising above the fury of the moment, does more than simply repeat, interpret, enjoin or enter the battle. Here, poets have an opportunity to show us, and themselves, the deeper human meaning of the incidents which we find so moving - or repellent - meaning that is far deeper than words yet indicated, somehow, by words. To do so in the thick of the fray requires great presence of mind in addition to artistic control of speech - a peculiarly intimate medium for art, akin to music. It is delightful to see so many rise to this occasion. Gratitude also to those many who sent fine entries, but could not be fitted within these pages.